USDCNY passed the psychological level of 6.30 on 31st January 2018. So far, the appreciation of the yuan is mostly driven by dollar weakness. This has become more obvious since the central bank reset the counter-cyclical factor to zero in the daily fixing mechanism. It implicitly means that the yuan would move more according to market forces. Moreover, domestic economic data has had little impact on the exchange rate. For example, the official manufacturing PMI was lower in January compared to December even though January is not the month of Chinese New Year. That shows a bit a slackness in manufacturing. This did not stop the yuan in January achieving the fastest rate of monthly appreciation in 10 years. With the quick fall in the dollar, exporters might chase after the trend to convert their dollar receipts into yuan. This may look illogical but could happen if exporters believe that the yuan will continue to strengthen, meaning they could get even fewer yuan later. This factor could give the yuan an extra push nearer the Chinese New Year when the exporters need to pay "bonuses" to their employees before they return home for the Chinese New Year. 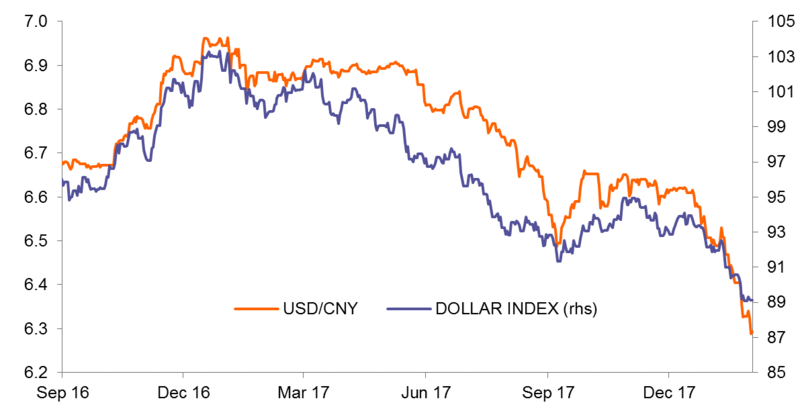 Due to the dollar weakness and the reasons stated above, we revise our forecast of USD/CNY to 6.10 by the end of 2018, which is equivalent to around 6% appreciation for the year. 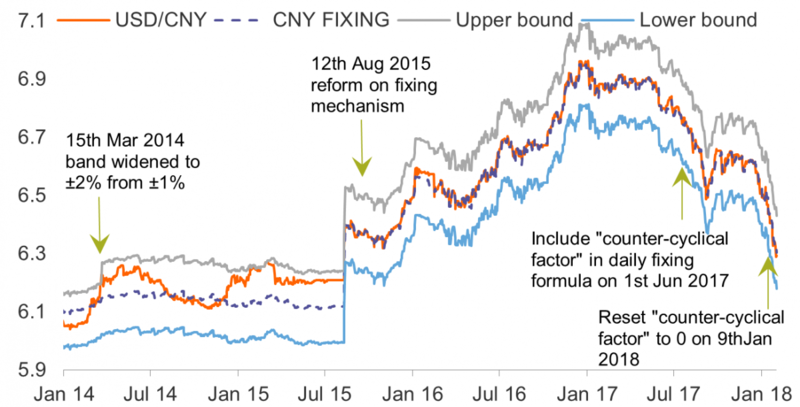 Any possibility of central bank intervention in the USD/CNY market? We do not believe that the central bank has a strong view on a particular level of USD/CNY that it would come into the market to intervene. It is more about the speed of appreciation if the central bank deems to intervene. A yuan appreciation that is too fast would attract not only "normal" investment money into China but also "hot money" that would easily turn into "hot outflows" when the yuan depreciates. As such, we expect that the central bank may monitor which assets the money inflows are invested in. When there are hot money inflows, the central bank may work with other financial regulators to step in to stop it.